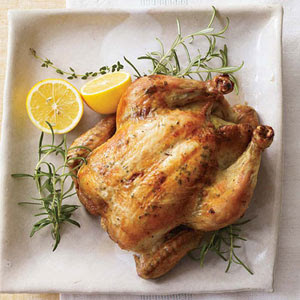 Roast chicken is a terrific anytime meal that will also give you the benefits of cooked chicken for other meals plus bones and bits for your stock bag. As long as you are home, even if you are doing something else, this will cook nicely in the oven .... and it will smell wonderful as well. 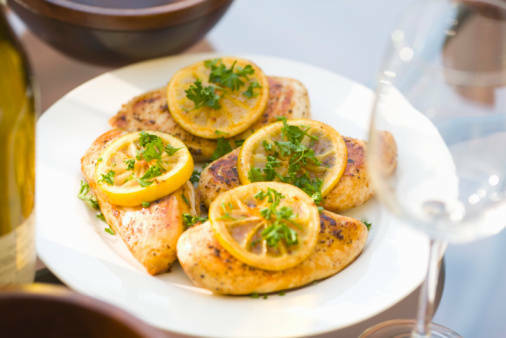 This recipe I think is especially delicious and very easy. I'm not giving you any amounts here because this recipe is very flexible depending on your needs. If your single, a small chicken will give you a generous dinner plus lots of leftovers, but if you're feeding a huge family you might need to get a baby turkey. The nice thing is this recipe is so easy it can easily be used for whatever size you need. 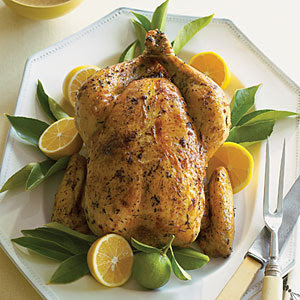 - Melt some butter in the microwave (about 1/4 cup for an average 3 - 4 lb bird) . - Slice all the lemons and all the onions. 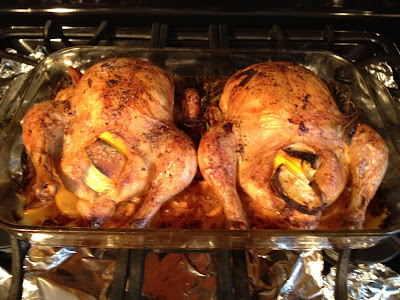 - Line the bottom of the pan with 2/3 of the cut up lemons and onions, then put the other 1/3 inside the cavity of the bird. If you're using rosemary put some of this inside as well. - With the rest of the melted butter brush your bird until it's completely covered, salt and pepper, and place into the roasting tray. Add a few sprigs of rosemary to the pan. - Cook for approximately 20 minutes per lb if it's over 10 lbs, 30 minutes per lb if it's smaller. You will know when it's done because the skin will be nice and roasted and when you stick a knife between the breast and the leg the juices will run clean. 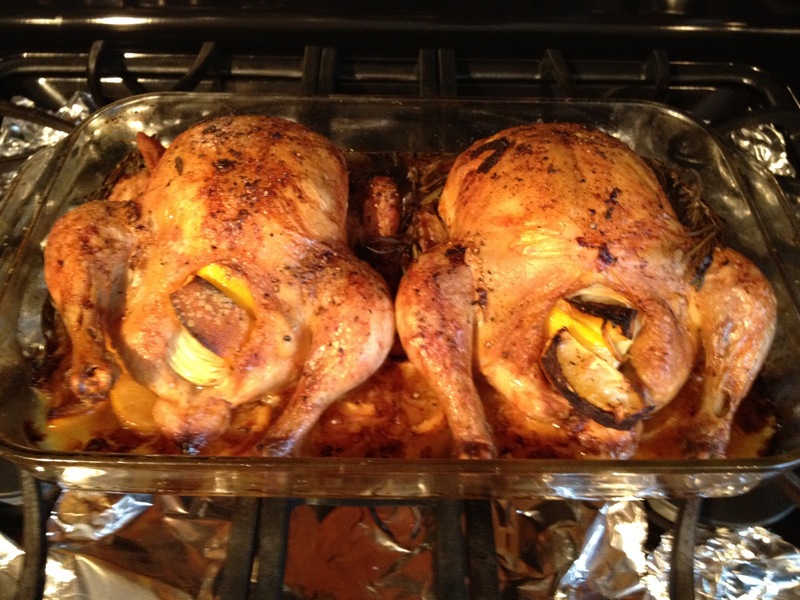 I usually cook two chickens at a time. That way I have a great meal plus more than enough leftovers for lunches and lots of bones for stock. 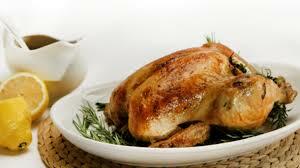 Once our meal is over, take as much meat off the rest of the bird as possible and freeze in meal size containers. Break up the carcass (This will be easier now that it's cooked) and put it in your bone and scrap freezer bag for when you make stock, along with any bits of lemon and onion and pan drippings you can scrap off the pan. These will all add to the flavour of your stock. I try to make this recipe at least every couple of weeks. 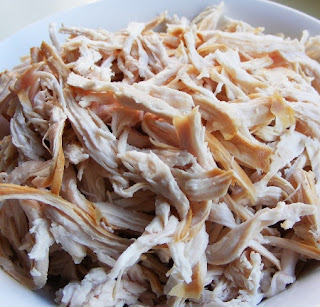 The extra meat is a great way to always have chicken available for lunches, and I never have to worry about getting enough bones to make great stock. You can also cook this just using chicken breasts or other chicken pieces, but try to get chicken with the bones and skin. Not only is the flavour superior but this will then also give you the benefits of bones for your stock bags. (will freeze ) It's best to separate the cooked meat and the carcass before freezing.